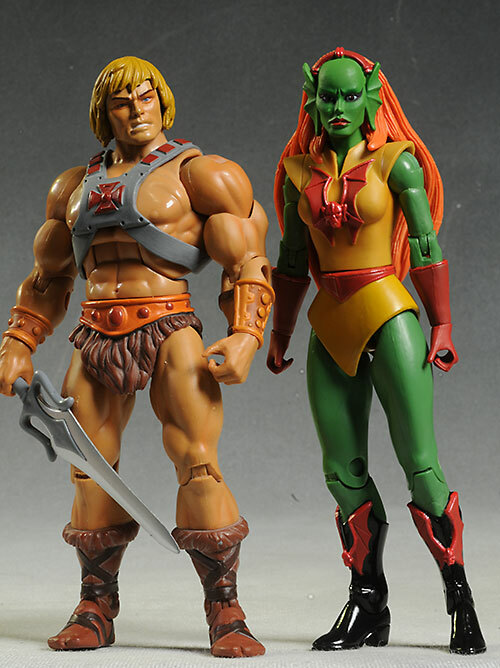 Another month goes by, and guess what - another Masters of the Universe Classics figure hits the porch! I've noticed something different the last few months...I haven't had any issues with my shipments, payments, subscriptions, or anything else related to Matty and Digital River. Are they fixing the problems? Too soon to tell, but it's worth noting that things have been smoother than ever before. The latest release is a villain, and a chick villain at that - Octavia! Like her first cousin twice removed, Octavious, she has some extra tentacles, but unlike him, hers are a bit more organic. Hubba hubba! She's a whopping $27, but even at that price point she's sold out at this point over at Matty Collector. They also have the 2014 subscriptions on sale right now! I like the packaging, and I also like that they've stayed consistent even after all this time. I don't collect these MOC, but if I did, I'd prefer all the card backs to match. That sort of consistency speaks to an obsessive collector like myself. This time around there were a metric ton of rubber bands, but at least the dreaded twisty ties are absent. The package is also personalized a bit to the character, which is always a plus to me. I think brief instructions on attaching the arms would have been nice this time around, even though it's not that complicated. When I first check out the lovely Octavia in the package, I was quite pleased. 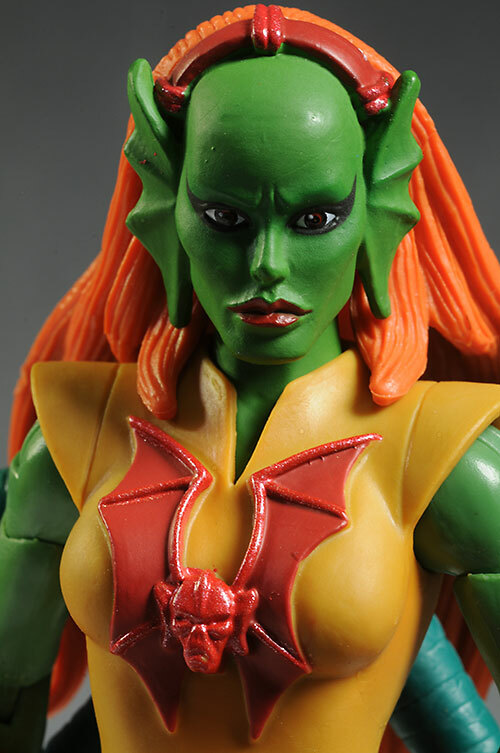 She has a cool alien amphibian look that works great with the Evil Horde designs. She's beautiful but clearly dangerous - in other words, the perfect woman. Once I had her out, I was less pleased, however. That's because of the design around the hair and extra arms, which conflict with each other. The long hair drapes down her back, hiding the holes for the additional arms. That's a nice touch if you don't have the arms in place, but when you put them on (small posts that pop into place), the hair restricts their mobility and the arms restrict the neck articulation, a lose-lose if I ever saw one. The only other issue I had is with the bottom of the short skirt. The V cut front needs to be just a smidge longer to better hide the hip articulation. Like other figures in the series, she comes in at 6 3/4 inches tall, which allows her to fit in nicely with the overall line. The paint is fairly clean, especially around the eyes and lips. 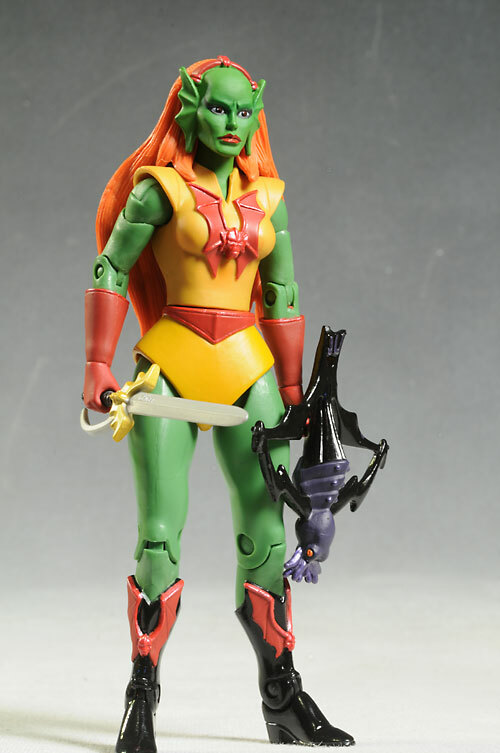 I also like the bright colors quite a bit - she's certainly going to stand out with the Horde. There is a bit of slop around some of the cut lines on the costume though, and it's lacking in paint detail. There's some sculpted edges and lines that could have used a different color to give the belt and gloves a bit more pop. 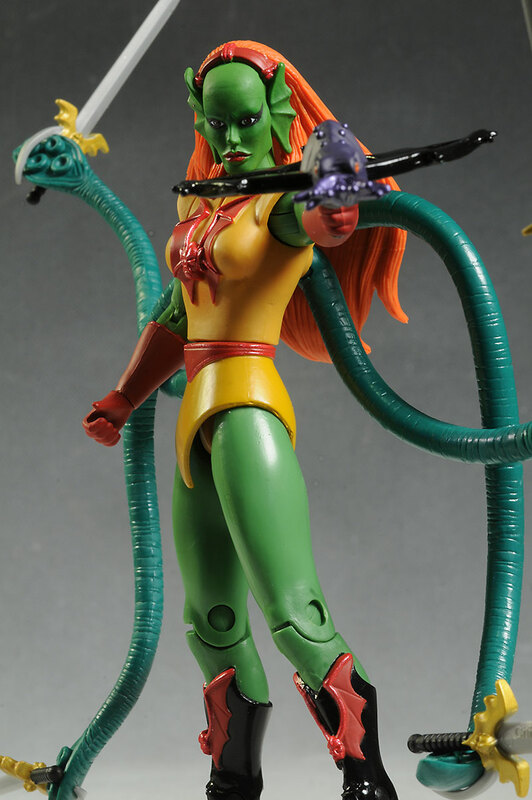 She has the usual MOTUC female articulation, with the octopus arms being the only real change. As I said in the Sculpting section, the octo arms are restricted by the long, solid hair. They have pin/disc joints at the back, so they can turn and tilt, and they are *slightly* bendy. The bendy feature doesn't work particularly well, however. The neck is, in turn, restricted by the arms and hair interacting. Her head is forced slightly forward by the arms, and can only turn a small distance. Even with the ball joint, there's no tilting or leaning in any direction. There's the usual ball shoulders, pin elbows and knees, cut biceps, cut wrists, cut waist, ball hips, and pin ankles. These all work well, much like past releases. While she doesn't have a second portrait, she does have those cool four extra arms. The are well articulated at the back (even if the hair gets in the way), and they look good holding the swords. Which brings me to the other quartet, the swords themselves. These can be held by the flat sucker 'hands', or in either of her sculpted human hands. While they are all identical, the sculpt and paint are quite good, and they are sturdy enough that they shouldn't wilt over time. Finally, there's her own unique crossbow, which she can also hold in either hand. It continues the aquatic theme, with a squid-like design. 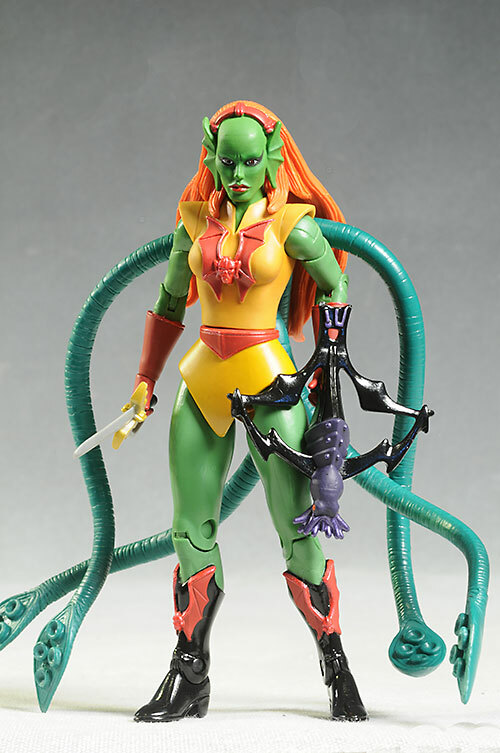 While the articulation is a bit more restricted this time around, she's still a fun action figure, and certainly better than most of what passes for one on the pegs at most stores. I was just getting accustomed to the old high prices, and the prices just seem to get higher. At $27, this is a very expensive 7" figure, almost twice what a regular mass market release would cost. That's a lot of lettuce for the exclusivity and likely low production run. Amazingly enough, she still sold out. Take care pushing the arms into place. The posts are small, and could be damage with too much force. You can never tell if an action figure is actually all that it appears to be until you have it out of the package. This is a perfect example. I was very taken with her in the pack. Once she was out, she dropped to a much more middle of the pack, average figure. The arm design didn't work particularly well, and the final result is a bit clunky. Still, we don't have a ton of females in the line, especial evil females, so I'm glad I've added her to the collection. - has her in stock at $45. 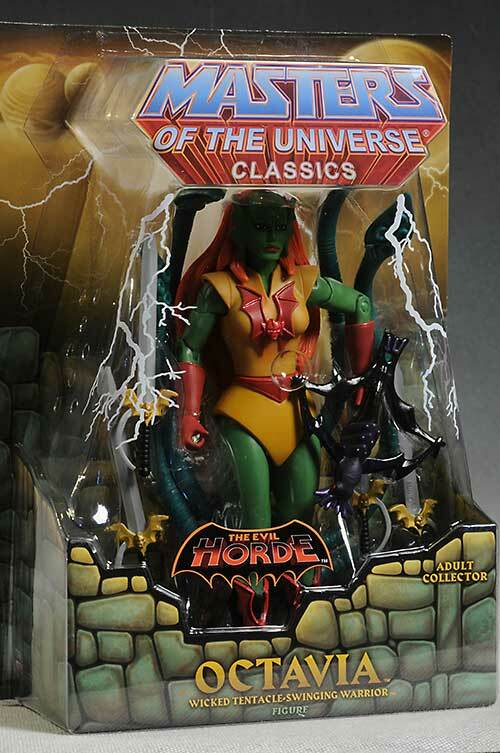 I've covered a lot of MOTUC figures, including Snake Face, Jitsu, Ram Man, Mosquitor, and Castle Grayskullman. - Before that, we had Rattlor, Mekaneck, Sir Laser-Lot, and before that we had the cool Griffin, Slushhead, the excellent Draego, Kobra Khan, Sorceress, Demo-man, Fearless Photog, Snout Spou, Wind Raider, the large Megator, the giant Tytus. Leech, Icarius, Clawful, the Faceless One, Catra, Sy-Klone, King Hssss, Vikor, Buzz Off, Grizzlor, Roboto, Gygor, Chief Carnivus, Whiplash, Orko, Count Marzo, She-Ra, Optikk, Evil-Lyn, Moss Man, Trap Jaw, Adora, Scare glow, Teela, Man-at-arms, Hordak, Zodac, Faker, Mer-man, Stratos, Webstor, Tri-klops, and starting out with He-man, Skeletor and Beastman together in one review.